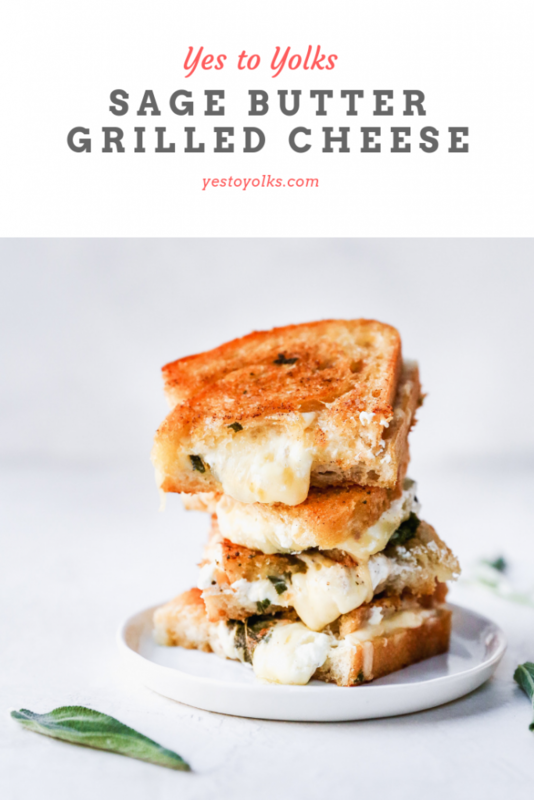 I always feel kind of silly sharing recipes for things like grilled cheese. I mean, we all know how to make a grilled cheese sandwich, right? Or at least the basic gist of it? I normally would hold off on a recipe like this because it just seems too…simple. But simple is never a bad thing, and that’s something I have to remind myself of sometimes. Besides, who wouldn’t want to talk about all this gooey glorious goodness?! 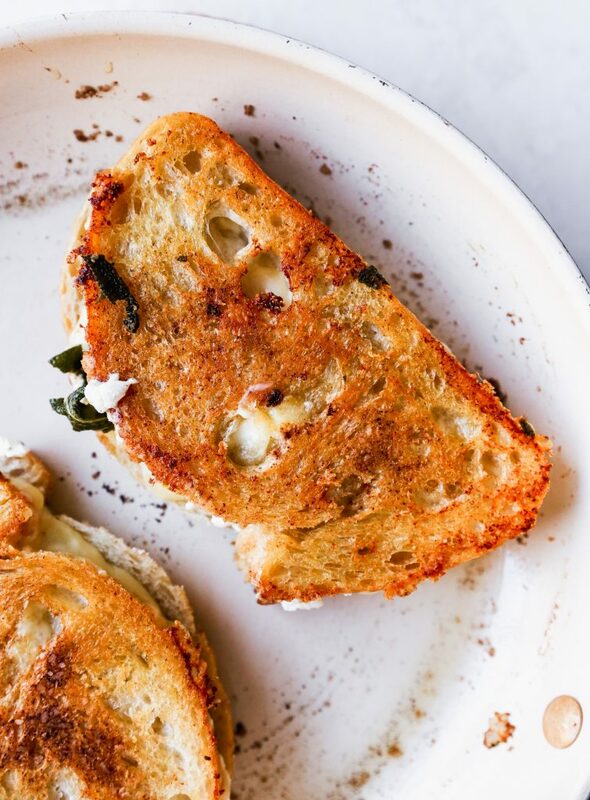 This grilled cheese tastes like pure coziness. Thanks, in part, to sage-infused butter. AKA, our favorite thing ever this time of year. Dan just about loses his mind over sage butter, and I am right there with him. The smell alone is intoxicating. 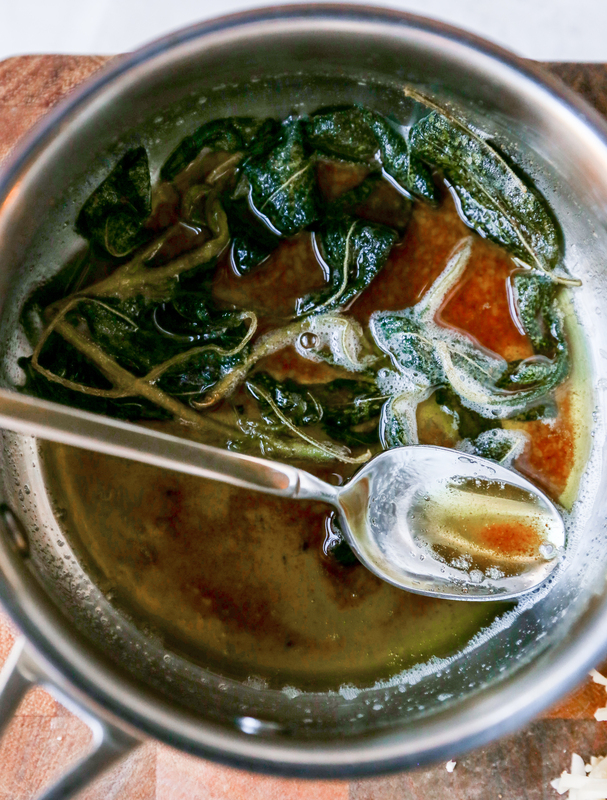 Fresh sage is just so…gosh-darn good! It’s spicy and cozy while still being herbacious and punchy. It’s awesome in all the things this time of year, and this sandwich is no exception. I like to infuse the butter with the sage while it browns. Then, I douse the bread in the sage brown butter and put the crisped sage leaves into the sandwiches for extra flavor. And that’s exactly what you get! The sage is an awesome compliment to the cheese situation here. Speaking of cheese, I used fontina (which is a grilled cheese must!) and some tangy goat cheese for more flavor. Gooey, warm, sagey, cheesy perfection. This may be a simple recipe, but that doesn’t mean that it isn’t absolutely fantastic. Melt the butter in a medium saucepan over medium heat. Add the sage once the butter is melted and lower the heat. Swirling the pan, cook until the butter is starting to brown and the sage leaves crisp up. Remove from the heat and season with salt. Spoon out the crispy sage leaves and set on a plate lined with paper towels. Allow to cool slightly before using with the sandwiches. 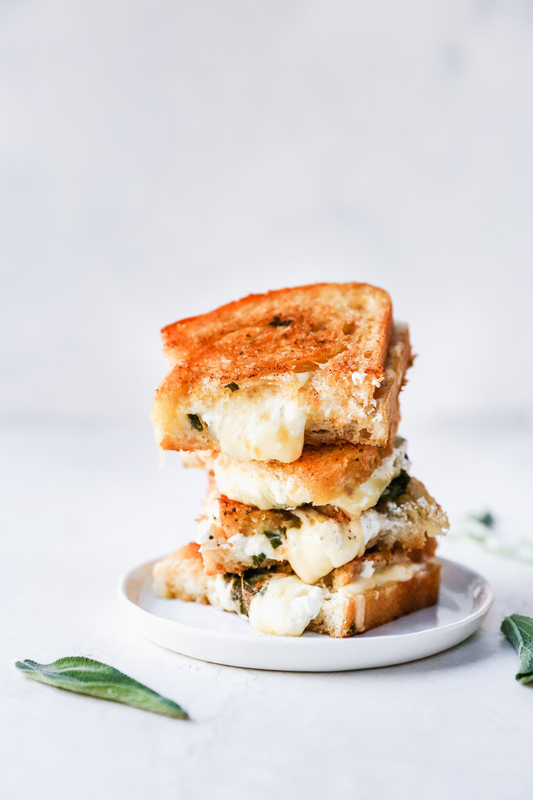 Assemble each sandwich by dividing the two cheeses evenly between four of the slices of bread. If desired, spread a little mustard on the remaining four slices of bread. 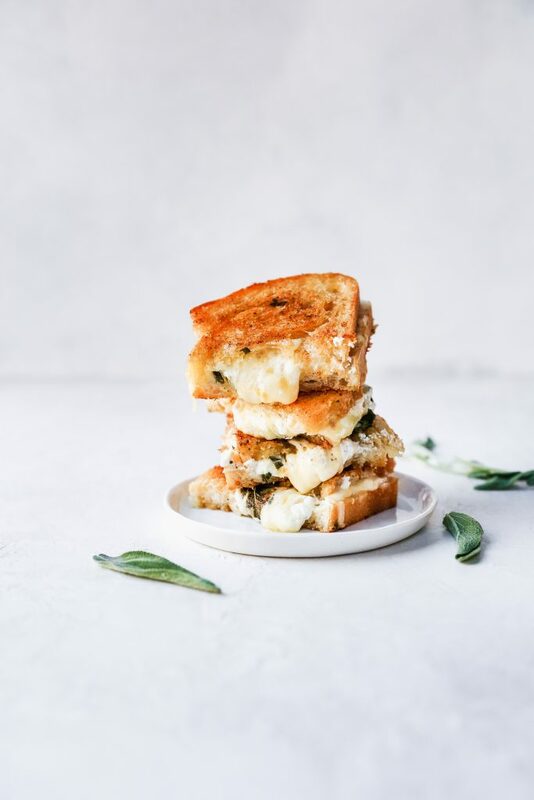 Add a few crispy sage leaves to each sandwich and then top with the mustard-coated slices of bread, pressing down lightly to form the sandwiches. Brush the outside of the bread slices with the sage butter and add them to the pan. I like to add a drizzle of the butter directly to the pan as well, to really drive home that sage flavor. Cook until the bread is crisp and golden and the cheese is starting to melt. Flip and do the same on the other side. 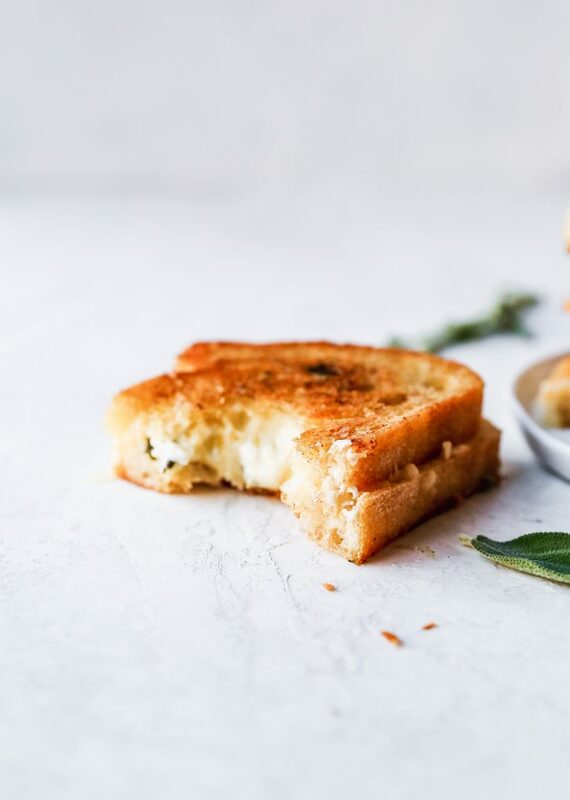 Serve immediately while the cheese is warm and gooey.